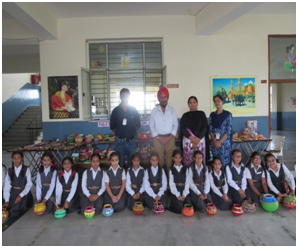 To mark the last working day before the closing of school for summer vacations, a function was organized at Shivalik Public School, Patiala on May 25, 2015. The celebration included numerous performances by the students. The function began with shabad gayan. The students enjoyed a glance of Western world through the western song and dance performances. Another glimpse of enjoyment was added with dance performance of tinytots. A street play was also staged. Charming kids performed and conveyed a message to “serve water and save birds” through their enactment. Then an energetic performance of Bhangra was presented. Overall, the function was very enjoyable and informative too. Madam Principal motivated the students to be in their routine and to protect themselves from heat.